USS Abraham Lincoln (CVN 72) is America's fifth Nimitz class carrier. The ship was named in honor of the nation's sixteenth president and is the second ship of the line to bear the name. The keel was laid on Nov. 3, 1984, at Newport News, VA. Four years later, the ship was christened and began a series of performance trials leading up to commissioning on Nov. 11, 1989, in Norfolk, VA. After completing shakedown and acceptance trials, Lincoln departed Norfolk in September 1990 to complete an inter-fleet transfer from the Atlantic to Pacific Fleet. To change fleets, the ship completed an "around the horn" transit of South America and participated in multilateral training exercises with the navies and air forces of several South American countries, including Brazil, Argentina, Chili and Uruguay. These highly successful operations, involving both air and surface units, were significant for their complexity and unique professional training, which firmly established Lincoln's reputation for excellence. On May 28, 1991, Lincoln set sail on its maiden Western Pacific (WestPac) deployment, nearly four months ahead of its originally scheduled date in response to Operation Desert Shield/Desert Storm. While en route to the Indian Ocean, Lincoln was diverted to support evacuation operations in the Philippines. The operation, Operation Fiery Vigil, became the largest peacetime evacuation of active-duty military and family members in history. Lincoln led a 23-ship armada that sea lifted nearly 20,000 evacuees from the naval station at Subic Bay. The ship moved nearly 4,500 people from Subic Bay to Cebu Island, Philippines. With Operation Fiery Vigil, complete, Lincoln took up station in the Arabian Gulf in support of allied and U. S. troops remaining in the region for Operation Desert Storm. Lincoln's air wing, CVW-11, provided nearly continuous combat air patrol, reconnaissance and support air operations over Kuwait and Iraq. Lincoln remained in the Gulf for more than three months, on alert for contingencies. After returning from WestPac in November 1991, Lincoln spent much of early 1992 in a Selected Restricted Availability (SRA) at Naval Air Station Alameda, Calif. In the latter part of the year, Lincoln began work-up training operations for a second WestPac. Lincoln spent the better part of a year preparing for the deployment and then departed Alameda on June 15, 1993. After a port visit to Hong Kong, Lincoln returned to the Arabian Gulf in support of Operation Southern Watch, the UN sanctioned enforcement of a "no-fly" zone over Southern Iraq. On Oct. 8, Lincoln departed the gulf at flank speed headed for Somalia to assist United Nations humanitarian operations there, as directed by President Clinton. The carrier spent four weeks flying patrols over the city of Mogadishu and surrounding areas, backing UN ground troops during Operation Continue Hope. Lincolnís crew celebrated an age old traditional "Crossing the Line" on Nov. 12, just prior to enjoying a four day visit to Perth, Australia. The Marine detachment performed a sunset review onboard Lincoln on Dec. 7, 1993 during a three day port visit, the last ft before returning to Alameda on Dec. 16, 1993. During the transit from Hawaii, family members and friends were able to embark for a Tiger cruise. After returning from deployment, Lincoln spent several months in SRA, refurbishing the ship and onboard equipment. Work-ups preparing the ship and air wing for the next deployment started in earnest in June 1994 and continued until early 1995. Part of the refurbishment included installing privacy bulkheads prior to integration of women into the crew in the spring of 1995. Lincoln was the first West Coast aircraft carrier to integrate women. 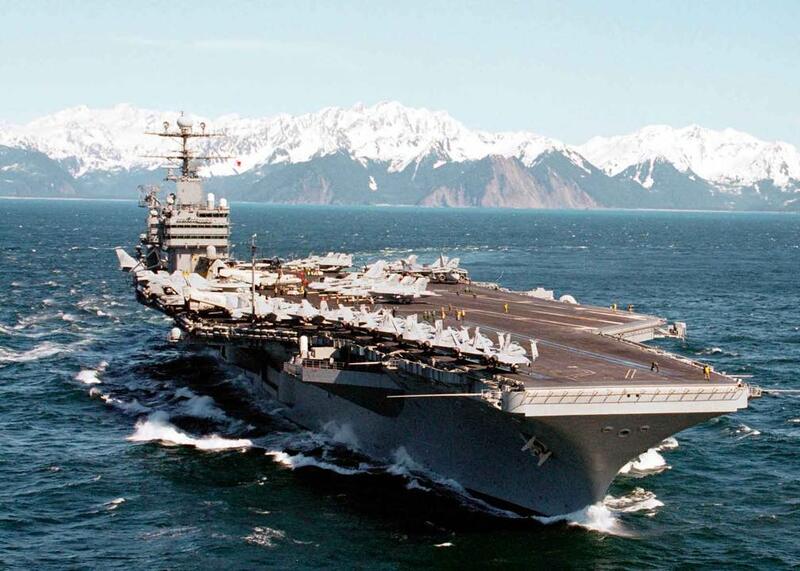 April 11, 1995, Lincoln departed on its third WestPac deployment. The ship made port visits in Hong Kong (May 5 - 9) and Singapore (May 14 - 19), before entering the Arabian Gulf May 26, 1995. The crew made port visits to Jebel-Ali, United Arab Emirates (U. A.E. ), four times during the first two months in the gulf. In response to renewed Iraqi military posturing, the Lincoln Battle Group was required to remain in the Arabian Gulf to participate in Operation Vigilant Sentinel. With plans to visit Australia dashed, the ship visited Jebel-Ali one more time before departing the Arabian Gulf on Sept. 11, 1995. The Lincoln took on family members and friends in Hawaii for a Tiger Cruise home, arriving in Alameda, Calif. Oct. 10, 1995. The Lincoln gave the crew a much need rest during a post deployment stand down Oct. 10 - Nov. 6, 1995. Then the Commanding Officer began a "Noahís Ark" cruise, bringing family members, vehicles and pets aboard ship for the transit to a new homeport, Puget Sound Naval Shipyard, Bremerton, Wash, arriving Nov. 18, 1995. During an Extended Drydock Selected Restricted Availability (EDSRA), the Lincoln crew, shipyard workers and contractors conducted need repairs to various systems throughout the ship. Lincoln entered dry-dock Jan. 8, 1996 to begin its first major overhaul since commissioning. Four Lincoln Sailors saved a local civilian from drowning in a nearby lake. In July, the flight deck non-skid is renewed and 536,010 gallons of JP-5 is on-loaded in preparation for leaving dry-dock. On Aug. 8, Lincoln moved out of dry-dock to Pier Bravo, PSNS, eight days ahead of schedule. The ship completed $200 million in repairs, modifications, systems upgrades and general improvements before conducting Sea Trials to test the integrity of the work Nov. 30 - Dec. 6, 1996, four weeks ahead of schedule. More than 2,000 guests accompanied the ship to its new homeport, Naval Station Everett, Wash., Jan. 8, 1997. The Command Career Counselors received "The Golden Anchor" for career counseling excellence in 1996 during the transit. The ship conducted carrier qualifications (CQ) and conducted general shipboard training, in a preparation for workups for a deployment in 1998. During spring operations, many distinguished visitors from the Chinese Navy embarked the ship, including the Chief of Chinese Naval Operations. A Lincoln Tiger cruise was held Aug. 4. More than 3,000 guests were treated to a short cruise in the Puget Sound, including carrier flight operations demonstration, steel beach picnic in the hangar bay, self-guided tours of the ship and an opportunity to experience the anticipated thrill of hearing "Moored, shift colors." On Aug. 5, Abraham Lincoln participated in the Seattle Sea Fair celebration by taking a day cruise into Elliott Bay while hosting area dignitaries and other high ranking officials. On Sept. 11, 1997, Lincoln pulled into San Francisco bay for the first time in almost two years to conduct an air power demonstration as part of the Fleet Week celebration there. The Blue Angels performed a show over the Bay within view of the city and the crew of the ship. After several hours, the ship departed at flank speed heading for homeport after several weeks of CQ and training. During its longest underway period (40 days) since WestPac 95, Lincoln conducted almost continuous flight operations, loaded 4,000,000 lbs. of material and ammunition, successfully completed nearly every phase of "Ready Carrier" qualifications and gave 100's of distinguished visitors, including 40 Admirals and Generals, an opportunity to see what their hard earned tax dollars are being spent on. After another underway period, Lincoln returned to Everett Dec. 20, 1997 just in time for the holidays. The carrier's fifth deployment commenced in August 2000 when Abraham Lincoln again traveled to the Persian Gulf in support of Southern Watch. On this deployment, the carrier, air wing and battle group ships earned the Navy Meritorious Unit Commendation. Additionally the ship earned the prestigious Arleigh Burke Award as the most improved command in the Pacific Fleet. Abraham Lincoln was in port on 11 September 2001. She was put to sea on 20 July 2002 to support Operation Enduring Freedom. She took up station once more in support of Operation Southern Watch before taking a port visit to Perth, Western Australia. It was during this time that the Lincoln was ordered to the Persian Gulf to take part in Operation Iraqi Freedom. This forced the Navy to extend Lincoln's stay from 20 January 2003 to 6 May 2003. The news of this extension was delivered to the ship's crew on New Years morning by the then Battlegroup Commander, RADM Kelly, with the famous phrase, "We don't need to be home holding our loved ones, we need to be here holding the line. Get over it!". The USS Abraham Lincoln returning to port carrying its Mission Accomplished banner, 2 May 2003. Abraham Lincoln and the carrier battle group and airwing helped deliver the opening salvos and air strikes in Operation Iraqi Freedom. During her deployment, some 16,500 sorties were flown and 1.6 million pounds of ordnance used. Sea Control Squadron 35 (VS-35), the "Bluewolves", was instrumental in delivering over 1 million pounds of fuel to these strike aircraft, one of the largest aerial refueling undertakings by a carrier aviation squadron in history. The carrier returned home in May 2003, in the process receiving a visit from President George W. Bush before officially ending Lincoln's deployment by docking at San Diego before returning to homeport in Everett, WA. Bush delivered a speech that day announcing the end of major combat operations in the War on Iraq. A large sign in the background for his speech read "Mission Accomplished". The White House said their services constructed the banner. As explained by Cmdr. Conrad Chun, a Navy spokesman, "The banner was a Navy idea, the ship's idea. The idea popped up in one of the meetings aboard the ship preparing for its homecoming and thought it would be good to have a banner, 'Mission Accomplished.' The sailors then asked if the White House could get the sign made.... The banner signified the successful completion of the ship's deployment," Cmdr. Chun continued noting that the Abraham Lincoln was deployed 290 days, longer than any other nuclear-powered aircraft carrier in history. Abraham Lincoln departed for her next voyage on 15 October 2004. The carrier was on a port call in Hong Kong when a 9.0-magnitude earthquake struck southern Asia on 26 December 2004. To help with the international relief effort and assist with search and rescue efforts already underway, the Lincoln deployed to the hard hit western coast of Sumatra to provide humanitarian assistance for Operation Unified Assistance. In mid-January 2005 the carrier left Indonesia after the Indonesian government refused to allow fighter pilots assigned to Lincoln to conduct air patrols and training flights. By law, US carrier-based pilots must practice at least once every two to three weeks to remain "fit," otherwise they are grounded. Despite the move into international waters, Lincoln continued to provide support to the region until 4 February. During the carrier's 33 days on station, she and her strike group delivered 5.7 million pounds of relief supplies. The 17 helicopters assigned to HSL-47 Saberhawks and HS-2 "Golden Falcons", attached to CVW-2 flew 1,747 relief missions along the western coast of Sumatra. The carrier's departure coincided with the arrival of the hospital ship Mercy. An Air Traffic Controller works approach controller in Carrier Air Traffic Control Center (CATTC) aboard the Nimitz class aircraft carrier USS Abraham Lincoln. At the end of February 2006, Abraham Lincoln went underway as part of a scheduled "WestPac" deployment. The carrier returned to Naval Station Everett on 8 August 2006 and on 27 August, relocated to Puget Sound Naval Shipyard for an upkeep/overhaul period. The refit was completed 26 March 2007, when Rear Adm. Scott Van Buskirk assumed command of Carrier Strike Group Nine (CSG 9) from Rear Adm. Bill Goodwin. On 19 March 2008, USS Abraham Lincoln departed Naval Station Everett for a seven-month deployment to the Persian Gulf. The ship returned to Naval Station Everett on 12 October 2008.